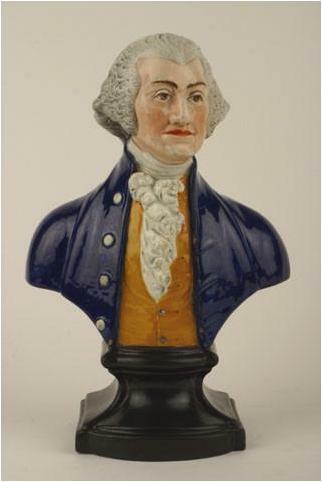 Enoch Wood, Bust: George Washington (1732-1799), ca. 1818. Earthenware. Bequest of Charles Allen Munn, 1924.56. As commander-in-chief of the Continental Army during the American Revolutionary War, George Washington attempted to fortify New York City against the British army. New York City fell, but Washington’s command helped the Continental Army win the war, and on April 30, 1789, George Washington traveled from his home on Cherry Street to Federal Hall to take the first oath of office. There is no more iconic figure in American history than George Washington, our first president and most famous Founding Father.